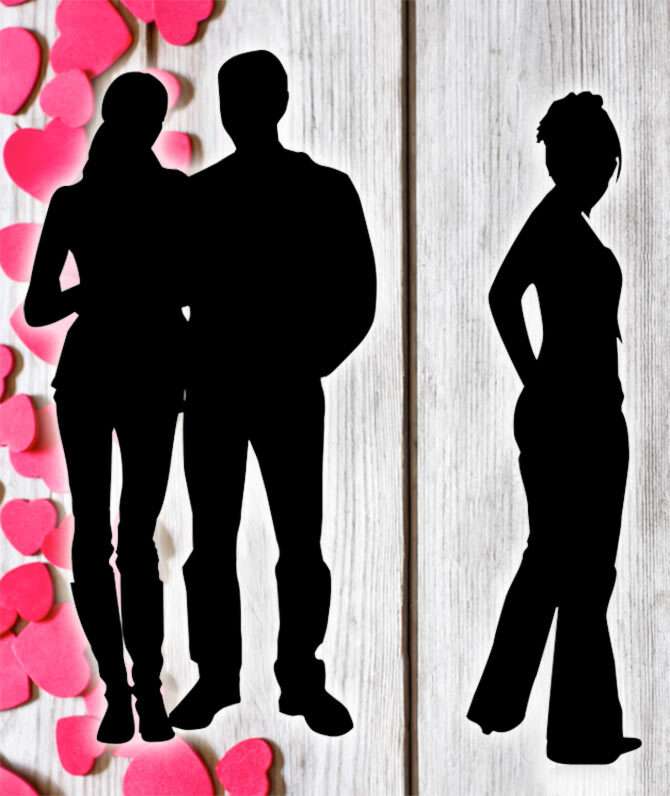 Rediff.com » Getahead » Is it OK to date your best friend's ex? Friendship and love are two very important relationships in your life. But if you are interested in your BFF's ex, would you choose love over good, old friendship? You can't like Aaron Samuels, that's Regina's ex boyfriend. Ex-boyfriends are just off limits to friends, I mean that's just like the rules of feminism." Back in 2004, Mean Girls' (an American teen comedy movie) Gretchen Weiners chimed the girl code without batting an eyelash. This very section of the Bible of friendship has remained evergreen over the decades. Let's fast forward to today. In these times, where it is oh-so-hard to keep up with the ever changing dynamics of relationships, let's ask ourselves -- Does the overplayed taboo of dating your best friend's ex still exist? A typical friendship would entail you to have lived vicariously through your best friend's relationships. Right from the dizzy 'I am in love' chase to the suffocating 'why me' break up (well in most cases). You've always been there for your best friend. Wouldn't dating their ex feel like a violation of your conscience? 'Do what makes you happy and deal with the consequences later' works for some as the perfect mantra. If this fresh start makes you happy and you are willing to risk stepping down on the friendship ladder and face the probable repercussions, then by all means go ahead. After all, if they had their shot and it didn't work, it doesn't rule out the fact that you can't have yours. Some view it as the ultimate betrayal of friendship. On the other hand, some, including Taylor Swift, are completely accepting of the prospect of dating her best friend's ex. She says, "It's almost like the sisterhood has such a higher place on the list of priorities for us. It's so much more important than some guy that it didn't work out with." She definitely has her hoes-over-bros and sister-over-mister ideologies on point. Love and liking definitely have uncanny timing. They spark up when you least expect it to come along. It is understandable that the situation is overwhelming and you're torn between both ends. Exes are always a touchy topic. Writers, artists and musicians have woven their art around it since time immemorial. All tied together by one belief -- love. Moment of truth -- Can your feelings be controlled? No. Can you extinguish a chemical connection? No. Can you decide whether or not to act on it? Yes. In such relationships there are three parties involved. You -- 'The master of your fate' and 'the captain of your soul'. Your best friend, who is a probable blessing in your life. Lastly, the ex, who once upon a time was centre of your best friend's universe and now, might be the centre of yours. In order to maintain calm and composure in this pseudo love triangle, the first checkpoint is to make yourself sure of your feelings. Ask the squeaky voice in the back of your head whether it's just mere infatuation or whether you feel the love with every fibre of your being. After all, it is your best friendship at peril. Is it worth the risk? More often than not your best friend will not be okay with the fact that you're dating his or her ex. It is always a good idea to run it by them even if you're scared of their reaction. This is imperative because nothing is worse than finding out that the two of you were sneaking around behind your friend's back. Even if your friend has indeed given you the green signal, always think twice. It may sound trivial, but there is a difference in saying that they are okay with the romance and actually seeing it unfold. The popular saying goes, "Time heals all wounds." Make sure that there is an adequate time interval after your best friend's breakup and your new relationship. The more time you give, the less the pain for them. Just like hand-me-downs are tacky, so are man-me-downs. Since we're talking about time, another point is to give your friend time to accept the relationship. You could probably expect a series of reactions ranging from pride screaming out loud, "Great! I'm happy for you," to old wounds reopening and lamenting "Why do you want my ex? You could have chosen anyone else." They definitely do have a point there. Out of all the fish in the sea, going after theirs may seem a little peculiar. But what do you fall back on if your 'sea' is a small pond? The queer community is so select that the odds of meeting someone without a mutual friend or ex are almost negligible. The celebrity and A-listers also have a very exclusive circle in which they seek relationships. VIPs become the talk of the town when they serial date, all the more when they date their friend's exes. Back in 2009, Kate Hudson dated Alex 'A-Rod' Rodriguez and then he went on to date Cameron Diaz in 2010. Following which, Kate began seeing Justin Timberlake who also happens to be Cameron Diaz's ex. Soon after Cameron Diaz referred to Hudson as being one of her 'good friends' during an interview with Naomi Campbell. Former Disney favorites Selena Gomez and Miley Cyrus both dated Nick Jonas. Friends (an American television sitcom) co-stars Courtney Cox and Jennifer Aniston also dated Adam Duritz. The list is endless. Several relationship coaches are against the idea of dating a friend's ex. Michael Valmont, a relationship and social coach vehemently said to 'avoid it like the plague'. Let's weigh out relationships. Good friendships last much longer than the usual relationship. Loyalty tilts in their favour as well. But at the same time they may not bring the pinnacle of happiness that a relationship would bring about. They are two very important relations in one's life. But confusing two good ingredients doesn't always make a yummy meal. Maintaining both these relationships together in your life will be like playing one of our childhood's favourite games, Minesweeper. Something could unknowingly trigger a world of pain for either parties. It is strongly believed that if your heart is in something and you put a world of effort into it, you are unstoppable, be it the best friend or the boyfriend or both. Just like it was said in One Tree Hill (an American television drama series), "Imagine a future moment in your life where all your dreams come true. You know, it's the greatest moment of your life and you get to experience it with one person. Who's standing next to you?" Think, breathe, decide, act and breathe again. How to make your relationship cheat-proof!